Northfield Mountain in Northfield, Massachusetts, has offered great cross-country skiing to the public for thirty-seven years. Twenty-five miles of meticulously groomed trails welcome the novice and challenge the expert. The summit often holds snow well into March. Read more on the official web page. The mountain opens for skiing after the first good snowfall around mid-December. The schedule runs Wednesday to Sunday, 9:00 AM to 4:30 PM. The trails are open during most school holidays and vacation weeks. Call 800-859-2960 to confirm operation. 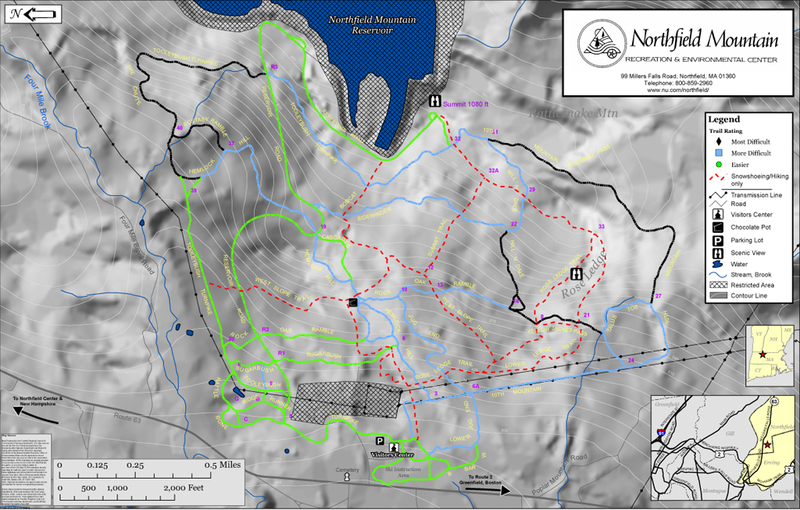 Northfield Mountain, with 810 feet of vertical, rises 1100 feet above the floodplain meadows of the Connecticut River valley. The ski trails are situated on its western face. A map (592 kb jpeg image) shows contours and terrain shading.